The Automata Blog: Gear generator tool allows you to design full gear trains and see them in action! Gear generator tool allows you to design full gear trains and see them in action! This new online Gear Generator tool can be used to simulate sets of spur gears. 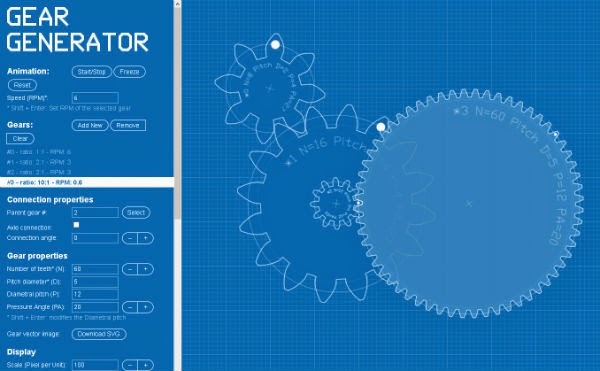 You can plug in all kinds of a parameters, and then animate the gears at various speed to demonstrate working mechanism. You can also download the final results in SVG format. The tool allows you compose full gear layouts with connected gears to design multiple gears system with control of the input/output ratio and rotation speed. The gears are of the involute type which is what most of the world wants -- except perhaps for the clockmakers. This tool is fantastically useful and very well designed too! Here is where you can check out and use the free online Gear Generator tool. To learn more about gear design, check out these great reference books such as Dudley's Handbook of Practical Gear Design and Manufacture, which provides comprehensive information on the design and manufacture of gears for the expert and novice alike. Topics include: Gear Types and Nomenclature, Gear Tooth Design, Gear Reactions and Mountings, Gear Vibration, and The Evolution of the Gear Art.